(1) Season’s progress? 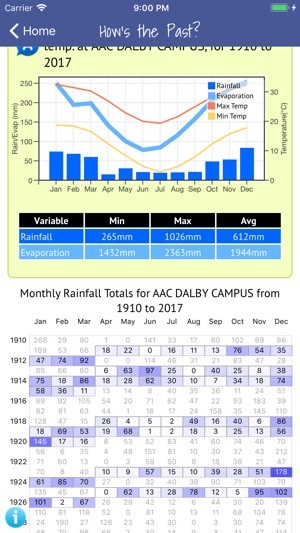 When adjusting inputs during a crop or pasture season, how does the current season compare with previous conditions in terms of rainfall, temperature, heat sum or radiation? (2) How often? 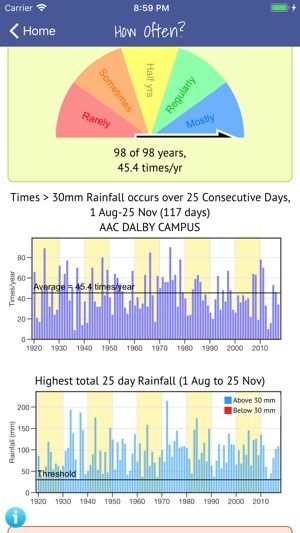 What is the chance of a sowing event based on amount of rainfall over 5 days? How often is a heat sum achieved in a set period of time? 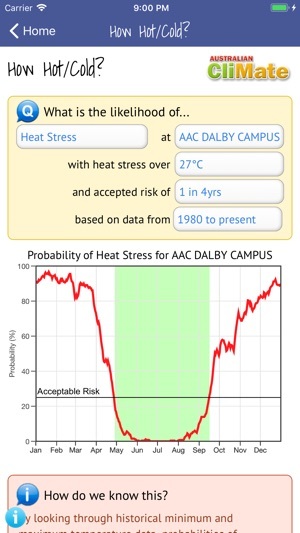 What is the probability of temperature being below a critical level for germination or flowering? (3) How wet? N? How much water and nitrate have I stored over the fallow? This may help me adjust inputs to better match yield expectations. (4) Potential Yield? 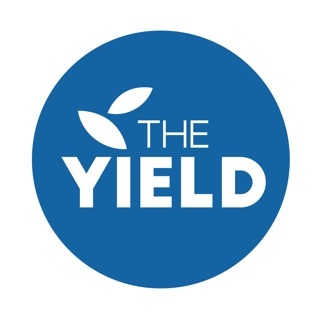 is a re-enactment of the Potential Yield calculator (PYCAL) first developed by S and D Tennant, Western Australian Department of Agriculture in 1993 and 2000. (6) How hot-cold? When determining an ideal sowing date, when are heat and cold stresses lowest for the optimum flowing time? (7) How likely? Based on current ENSO conditions, what is the probability that rainfall or temperature is greater than or less than key thresholds (e.g. terciles, median) and how reliable have these forecasts been in the past? (8) How’s El Nino? What is the current ENSO status based on key atmospheric and oceanic indicators? 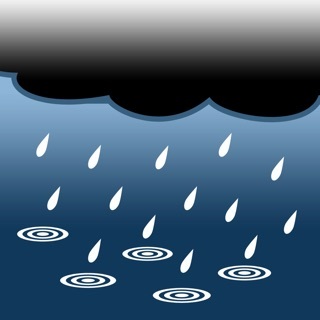 What is the Australian Bureau of Meteorology’s interpretation of this? (9) How’s the Past? 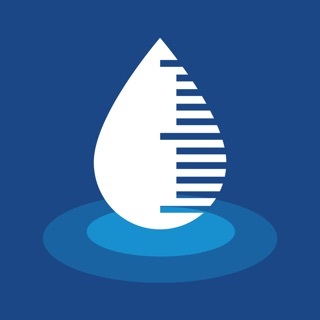 Presents views of monthly and annual rainfall and temperature summaries to allow you to explore relationships and patterns. (10) What Trend? 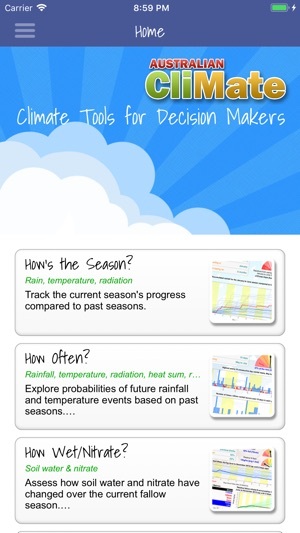 plots weather records to explore trends. A time series graph with a line of best fit (least sum of squares), differences from the mean and cumulative differences (residual mass curves) provide other views of long term data. Do not install this app. The first time you run the app, it takes a long time before telling you that your data is collected for analytics, then you can turn it off from within the app settings. It doesn’t tell you that the collected data will be removed if you disagree. And even after you uninstall the app, your data has been stored somewhere permanently and inaccessible by you. Very detailed, easy to use. Easy to compare over the years and by location. The new upgrade has made this app useless. It will not download climate forecasts at all ( no it's not my network) and if you contact support, your messages bounce back as their server has decided they're spam. Ouch! Sorry for the problems - I can't specifically remember any issues with the climate forecasts - the old version did have problems as external links had been changed on BOM's servers- however the new version of CliMate was relatively new at the time of your review, and could have had some issues. We've released several updates since then. 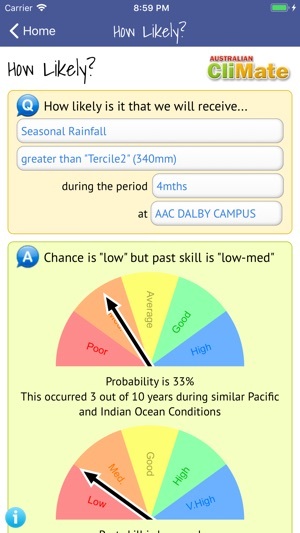 Besides the forecast maps that are provided by BOM and Queensland Government, CliMate calculates forecasts on your device using linear discriminant analysis methodology and sea-surface temperature data downloaded from BOM. This will soon be changed over to use BOM's newer methodology. As for your email issues, it might have been something to do with your email address being on a block list (as a result of someone else using your email to spam) . Emails from CliMate get sent to several people via the hosting company's mail server, and then through individual mail servers. We try and respond within a couple of days and quite often telephone the sender to sort out their issues. Anyway... hope your experience is better in the future.